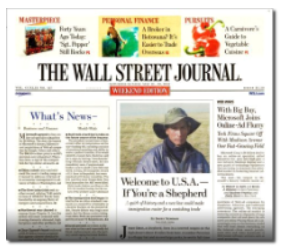 Get a FREE 26 Week Subscription To The Wall Street Journal! Also some locations may receive coupon inserts inside the WSJ on Saturdays or Sundays(it may vary by location). To get a FREE 26 Week Subscription To The Wall Street Journal you need to register and take the survey once you do that you will earn $20 in reward points which if you are a current member and have been saving your points for a while you can get this magazine for free. You can just sign up thru the link and you will get it free, no strings attached. H4F posts only legit freebies, been doing this for years. I signed up for this a few months ago. I’m getting WSJ for 23 weeks for free. I get 5 days a week plus weekend edition. I signed up for this last winter. Not a bad paper! I got this a long while ago it seems. I am “still” getting the WSJ every morning.. I LOVE IT!! I could never afford to pay $40 something month for a subscription. You won’t regret getting this.. Does this paper have coupons in it? I have never bought this one, Thank you! Some subscribers get coupons in the Saturday papers ( most weeks) ,but not all.It depends on the carrier in your location. No coupons come in this paper. It takes about 6-8 weeks to receive. I just started receiving mine and the weekend edition came with the smart source insert. I live in Los Angeles. I live in TN. The weekend edition has coupons depending on where you live. I started getting my subscription last week but today there was no paper. Wondering who I call about that? Thank you I get this for the smartsource insert. I’m gonna order for my coupon friend now. the first day I started to get this was on a Saturday, Sunday it didn’t come, Monday it came, Tuesday(today) it didn’t come, does anybody get this daily? Just to clarify, none of ya’ll have gotten any type of notice to pay for it, or even a renewal where they ask for money? No, this is legit and I have gotten a lot of other magazines from this site for free as well. You just answer questions about products and a short survey. There are no pop ups and it is a completely real and easy thing to do! does this paper have coupons in it?